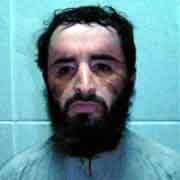 Looks like the Pakistanis ghraibed him up a bit. True or False: "Google policy does not permit ad text that advocates against an individual, group or organization" ? ...Amy Goodman being savaged by a Marine sergeant who has served two tours in Iraq during a Los Angeles Times Festival of Books forum televised on C-SPAN? During Q&A he asked her what qualified her to talk about Iraq. She wouldn't answer. She decided instead to ask him two questions, one about the legitimacy of the war and one about morale issues. He stated, drawing some catcalls from the crowd, that WMDs didn't matter. Earlier, Goodman had made the point that if Americans could see the pictures of dead and maimed Iraqis we'd call for an immediate withdrawal. This Marine countered that of Americans had seen picutres of life under Saddam Hussein that the invasion would have been more widely supported here. He also stated that low morale tends to be the province of those who are stuck in rear bases without contact with Iraqis and without the first hand experience of building a school or repairing a water main. She just let it all slide by. 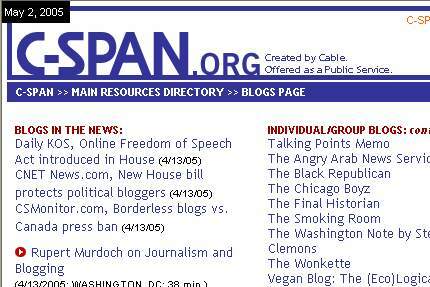 Of all the places C-SPAN could direct people to to learn about the Online Freedom of Speech Act, they choose KOS. A congressman who is not an ex-exterminator right wing wacko, took a trip paid for by lobbyists. Springsteen chose to be fairly economical with his comments between songs, although he did...lambaste the "dinosaur" mentality of the Bush administration... He ad-libbed a "That's right" after one audience member yelled "(Expletive) the president" at one point. Bruce Springsteen, born 23 September 1949, still strumming for a living, calls someone else a "dinosaur". They march on May Day, naturally; you simply must read what they were chanting. Poor dumb bastards.